It was G.K. Chesterton who said, "The Bible tells us to love our neighbors, and also to love our enemies; probably because they are generally the same people." A humorous and certainly exaggerated line to be sure, yet is it not true that even the best of friendships can have their ups and downs? Perhaps the best friendships by necessity will have their difficulties at times. This is certainly the case with Moses and his relationship with God. From the moment Moses received his calling in front of the burning bush on the mountain, Moses and God would journey together through victories and defeats, in the midst of good times and difficult ones. They would work together in concert as Moses faithfully led God's people in obeying God’s will, and at other times Moses would try God’s patience while God, on more than a few occasions, would have Moses baffled and confused. 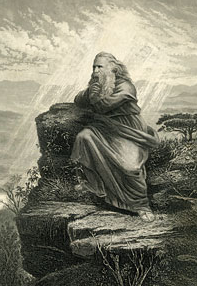 Moses begins his journey with God as a reluctant follower. He answers God's call to lead the people of Israel out of slavery in Egypt, out from under the oppressive hand of Pharaoh, the most powerful ruler in the world. There must have been much fear and trepidation in Moses, but he is faithful. Utilizing Moses' faithfulness, God leads the people out of Egypt, which leads to great victory in the crossing the Red Sea. Here Moses displays great courage and moral fortitude. It is perhaps one of his best moments in life. And as Israel begins its wandering journey through the wilderness, making its way over many years to the Promised Land of Canaan, Moses also journeys with God. And has time goes by, Moses and God develop a relationship that certainly remains as master and servant, but something more begins to develop. Could that something be called friendship? As Moses nears the end of his life, he and the people of Israel finally reach the destination they have dreamed about during the hot wilderness days and the cold desolate nights. Canaan, the Promised Land, sits right over the Jordan River; and now Moses is told that he may see the land, but he may not enter. Is it possible to imagine the crushing feeling Moses must have had to have come all this way in distance and in time to be able to see the prize before him, only to have it snatched away at the last moment? Can we imagine for a moment how Moses must have felt? Here he was on the threshold, ready to reach the goal that had become the purpose of his life because God had made it so, only to be told at the last minute that what he had longed for was not to be? The reasons for Moses exclusion from the Promised Land are not entirely clear, but there are a couple of hints given in previous chapters of Exodus. Perhaps Moses was being held responsible for the consistent disobedience of the people of Israel that he had led, somewhat like the ship’s captain being held responsible for the behavior of the crew. Moreover, there were certain incidents throughout the wilderness years where Moses had undermined God’s authority in his speech and behavior. Those who lead are always held more accountable, not because they have a different moral standard from everyone else, but because they are to model the standard for everyone else. Whatever the reason, Moses is to die with the Promised Land in his sight, but not in his grasp. "Then the Lord said to him, 'This is the land I promised on oath to Abraham, Isaac and Jacob when I said, 'I will give it to your descendants.' I have let you see it with your eyes, but you will not cross over into it.'" It is quite a sobering thing to look back on one’s life and wonder what could have been and what should have been done differently. Everyone’s life ends with unfinished business. If Moses only knew what he knows now at the end of his days, what would he have done differently? Surely Moses sits upon Mount Nebo pondering and wondering how things might have transpired if hindsight had been foresight. But perhaps to dwell on what Moses did not receive, is to miss the point, not only of this closing chapter of Deuteronomy, but of the purpose of life itself. We must not diminish the great disappointment found in this story, but we must also not lose sight of the larger point that comes to us as well: "Since then, no prophet has risen in Israel like Moses, whom the Lord knew face to face, who did all those miraculous signs and wonders the Lord sent him to do in Egypt-- to Pharaoh and to all his officials and to his whole land. For no one has ever shown the mighty power or performed the awesome deeds that Moses did in the sight of all Israel." The true goal of Moses' life was not to step foot into the Promised Land; if that were the case, the only truly significant aspect of his life would have come at the end. Moses' true purpose was being fulfilled all along the journey of his life-- in coming to know God more and more each day, Moses lived his life in such a way that the writer of Deuteronomy 34 could state that he knew God face to face. At the end of his life Moses sits upon Mount Nebo and converses with God, not simply as a servant would in a humbling way in response only to his master’s wishes, but as two old friends who have been through thick and thin together. Perhaps they speak of where they have been, perhaps they remind themselves of how it all began while Moses was searching for lost sheep on the mountain, or when they were in Egypt staring down Pharaoh, and then reminiscing about the many days along the journey, even the days when their relationship was strained. And as they look back, perhaps Moses comes to understand that his inability to enter Canaan is not a failure of his life's purpose, but just one last frustration in the midst of a life filled with disappointments. It is a life also lived in great joy because it was faithfully lived in service and in obedience to his God, who Moses now knows is also an old friend. And what a fitting tribute to a life well lived that God, Moses’ old friend, buries him and delivers his eulogy! The fifth century bishop St. Augustine wrote quite extensively on friendship. It is Augustine who defined salvation itself as friendship with God. And such friendship cannot be had overnight, it cannot be achieved instantaneously. Like all friendship, it takes a lifetime to build to nurture and experience. And the destination of our journey of discipleship, of following Jesus, cannot be reached without the journey. May our journey of faith take us to the end of our days, so that it will be said of each and every one of us that, like Moses, we knew the Lord face to face. from Allan R. Bevere, The Character of Our Discontent: Old Testament Portraits for Contemporary Times.